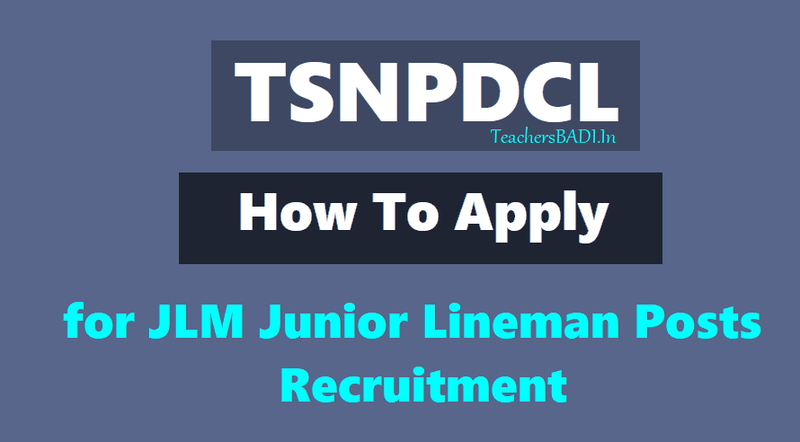 How to apply for TSNPDCL JLM Jnunior Lineman Posts Recruitment 2018 (JLM Jnunior Lineman Posts Posts), TSNPDCL JLM Jnunior Lineman Posts Online application form @ www.tsnpdcl.cgg.gov.in, Step by step online application from submission process for JLM Posts in TSNPDCL. Northern Power Distribution Company of Telangana Limited, Vidyut Soudha has given JLM Jnunior Lineman Posts Recruitment 2018 notification and applications are invited On-line from qualified candidates through the proforma Application to be made available on http://tsnpdcl.cgg.gov.in to the post of JLM Jnunior Lineman Posts. The post of Junior Lineman in TSNPDCL is vacant. All the aspirants interested for the post can apply from the official website. Applicants with 10th pass degree and experience can apply for these posts. The qualified candidates will be given a good salary and the experienced candidates will be given first preference in the selection process. Total No. of Vacancies: 2553. Candidate has to visit the website http://tsnpdcl.cgg.gov.in to view the detailed notification and User Guide. The fee mentioned at Para- I (5)(a) is to be paid online by visiting the link MAKE PAYMENT in the website duly following online instructions. on to http://tsnpdcl.cgg.gov.in and click on to complaint box.